It’s raining in San Francisco today. We’ve been mourning the lack of moisture all over the West this winter, which is nothing like past winters I’ve spent in the bay area. I remember walking the length of campus in the pouring rain to get to a midterm. The class was held in a frigid basement room of the old women’s gymnasium, next door to the anthropology collection, and I thought I was going to freeze to death before finishing that midterm. My pants and feet were soaking wet and I’m sure my toes turned blue. I remember not really caring about the test any more. I just wanted to finish it and get out of there! Ah, those were the days. The fool in me thinks You should go back to school! You’re certainly not getting a job so you don’t have anything better to do! Ha. No way. The smarter part of me remembers that I promised to never repeat the thesis-writing experience. What can I do instead, now that I’m without employment, internships, or medical crises to keep me occupied? I’m thinking about learning to sing or dance (I’ve been watching way too much Glee on Netflix). Or maybe I’ll through myself headlong into organizing and decorating the house, something that might never get done otherwise. Before I get to whiny, let me get to the point: These muffins are bright sunny spots on this grey day and on my recent dark mood. The solutions to my boredom and idleness are of cooking and blogging, of course. A job would help too. I have at least one really, really incredible prospect in my sights. Meanwhile, I’ll be making these muffins over and over again until I get tired of them. They are undoubtedly the best thing I’ve made in a long time. I knew they would be as soon as the idea hit me. 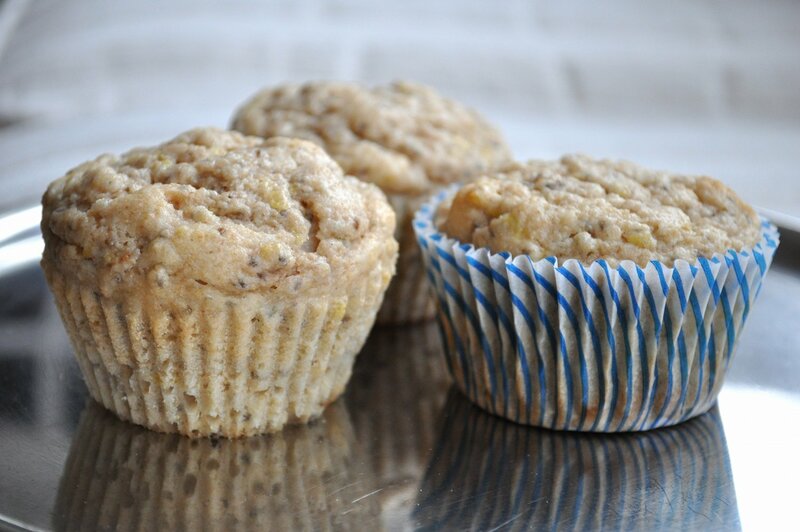 What about lemon poppy seed muffins but with chia seeds instead! They could be vegan! 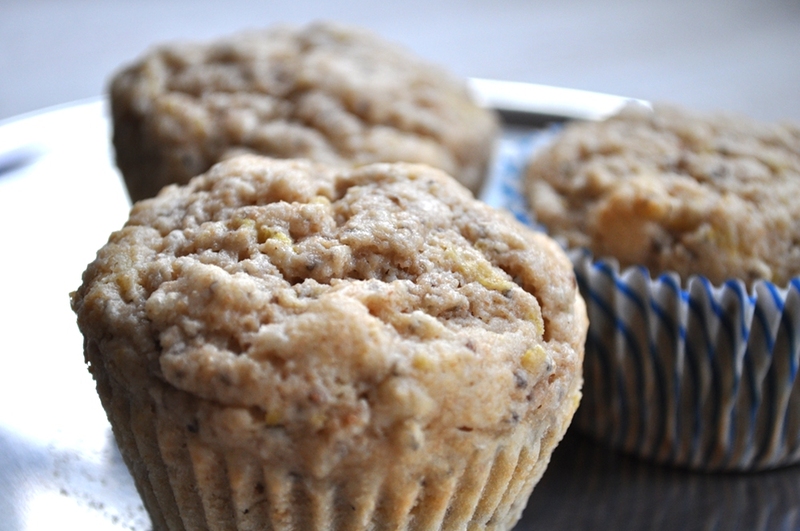 Lemon poppy seed muffins have always struck me as the most dainty, sophisticated muffin. They don’t have much substance and often toe the line between cupcake and muffin. With chia seeds, though, and whole wheat pastry flour, these muffins are like undercover spies in the world of frivolous pastries. A modest amount of honey adds the perfect sweetness and the lemon flavor is surprisingly strong, in a good way. If you have not tried chia seeds I encourage you to get some. As gross as this may sound, their coagulating abilities are just so…cool. I mostly use them in hot cereal and overnight oats but now that I’ve baked with them once I think they will join flax seed meal as an essential part of my vegan baking. Line a muffin tin with silicone or paper cups. Combine chia seeds with water, whisking them together. Allow them to sit for 5-10 minutes. In a large bowl, blend flour, baking powder, and salt. In a separate bowl, combine lemon zest, soy milk, and lemon juice. Add honey and chia gel to soy milk mixture, stirring until honey dissolves and is thoroughly blended. Add wet ingredients to dry and stir gently till barely combined. 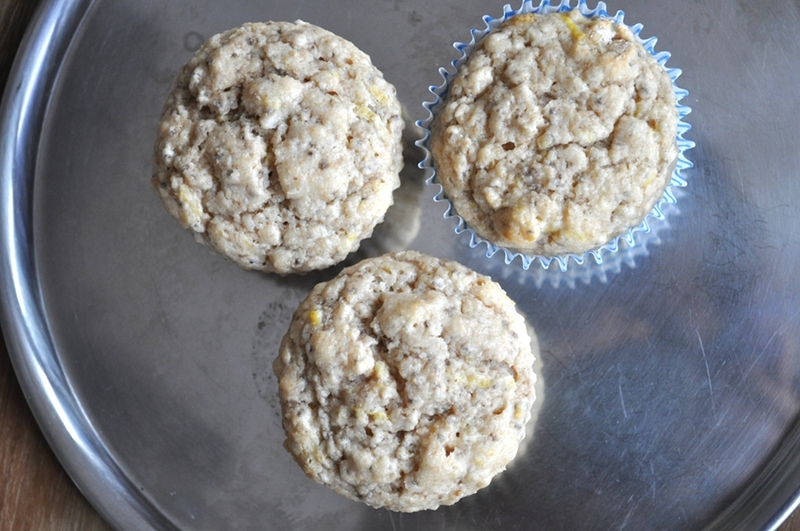 Spoon batter into prepared muffin tin and bake for approximately 20 minutes. Those look good, don’t they? Or maybe I’m the only one who thinks prickly little hunks of healthy stuff look appetizing. Humor me. 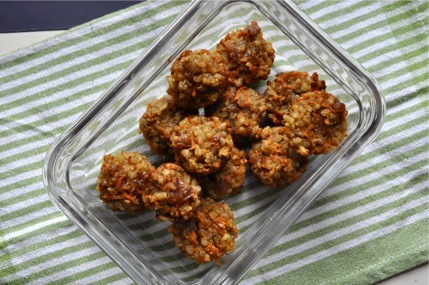 Grab a carrot, pull that bucket of dates off the top shelf in your pantry (What? You don’t have a huge container of dates in your pantry? Well go get some!) Put those cashews you’ve been munching on for days to good use. I know you have leftover rice or some other grain in your fridge. This isn’t so much a recipe post as it is a post about creativity. I’ve been thinking a lot about creativity over the past couple days. Training for my new museum internship started this week and learning through creative design is the institutions main focus. Creativity…design…those are two crucial aspects of blogging as well as more aspects of our life than we probably realize. They have always been intimidating words for me. I’ve never considered myself to be an “artsy” person and in certain circumstances I’ve felt uncomfortable pressure to be “creative”. Design? How could I ever design anything? So far, what I’ve learned about creativity in my internship is more relevant to this blog than I thought it would be. I have fresh motivation and renewed ambition. I cannot wait to see what I can really do with this blog if I let loose and break free of how I think things should be. Let’s just find out where this goes. What does this have to do with carrot rice pudding bites? 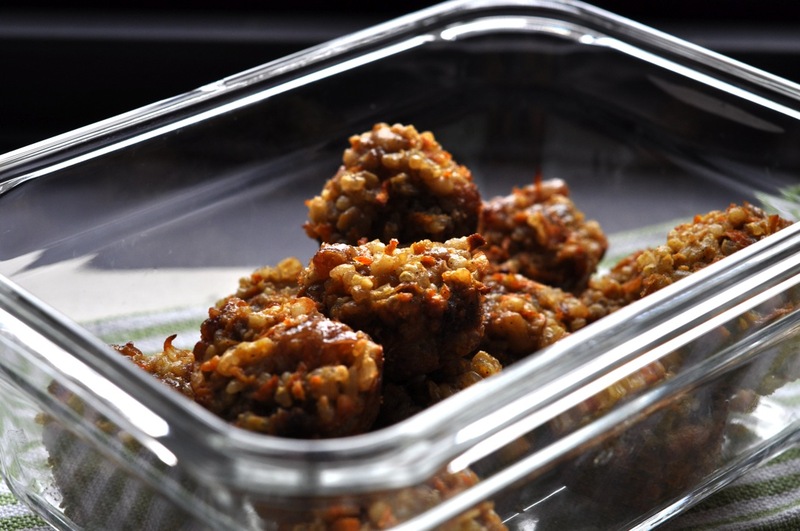 Carrot rice pudding bites are what happens when I let myself get creative with food. I have some kind of craving for a particular taste, flavor, shape, or texture. I have certain ingredients at my disposal. I really, really want to use something because it’s been in the fridge for bordering-on too long. I look at some recipes – thumbing through cookbooks and clicking through bookmarks online. In the end, I get pull out some ingredients, mash them together in a bowl, smoosh them into a mini-muffin tin, and bake them. How do they taste? Pretty good for being a total experiment in culinary creativity. Did Lee and I eat all of these tasty bites? You betcha – every last sticky-sweet little bite. Unfortunately, I have not quite mastered the practice of writing down what I’m doing when I’m experimenting in the kitchen. Thus, I don’t have a recipe. That said, I think wads/bites/hunks/balls like this are best made as free-form, creative, recipe-free items. Here are the basic components and a method that seemed to work for me at least once. Chop these up in a food processor. Pour this mix into a bowl and add the rest of the ingredients. Bake at 375 F. for 10-12 minutes, or until muffins/balls are firm and starting to brown. Munch away! These are surprisingly sweet for containing no processed sugar. I did two things that I’m very proud of last week. Really, I’m sure I did more but these two graced my kitchen in one night and were particularly memorable. First, I found an inventive way to use the last of the leftover bagels from my brief stint as a bagel-baker. They had been in the freezer for weeks and Lee had declared them inedible. Second, I made something in a pot that didn’t turn into chili, as do so many of my would-be soups and stews. This stew spawned from necessity and boredom. I was bored with making the same old things night after night and my dad was coming over for dinner so I wanted to serve him something somewhat special. Still, that special dish needed to be easy and use ingredients I had on hand, since I was getting ready to go out of town. It’s a good thing there were 4 ears of fresh corn in the fridge! I wasn’t about to let those go to waste. The stew came out thick (thanks to the pumpkin) and chunky (thanks to the corn and squash). I loved the bright red tomatoes against the yellow corn. My dad, Lee, and I really enjoyed it as an early fall dinner that captured some of the sweetness of end-of-summer corn. The bagel croutons were perfect and unique. Unlike regular croutons, they have quite a crust on them, which returns to it’s chewy bagel state when soaked in hot stew for a few minutes. The result was an almost meaty texture that stopped my spoon from gobbling the stew too quickly. Cut tomatoes in half and place them, skin side down, on a lightly-oiled baking sheet. I suggest lining the pan with aluminum foil, as the tomatoes tend to be rather messy. Bake in the oven for 45 minutes to 1 hour, or until the tomatoes are shriveled and juicy. When cool, cut each half into two or 3 pieces and set aside. You will add them near the end of cooking the stew. Cut corn off cobs, gathering it on a cutting board or in a bowl. Meanwhile, preheat a large saucepan or pot. Add olive oil to coat the bottom of the pan. Add onions and garlic, cooking until the onion is soft and translucent. Add corn and continue to cook, partially covered for about 5 minutes, stirring occasionally. Add herbs, allspice, chili powder, salt, and pepper. Cook about two minutes. Add broth and pumpkin puree and pattypan squash, stirring well to blend everything together. Reduce heat to simmer and cook for 10-15 minutes. Add edamame and roasted tomatoes and cook for 5 minutes, or until edamame are heated through. 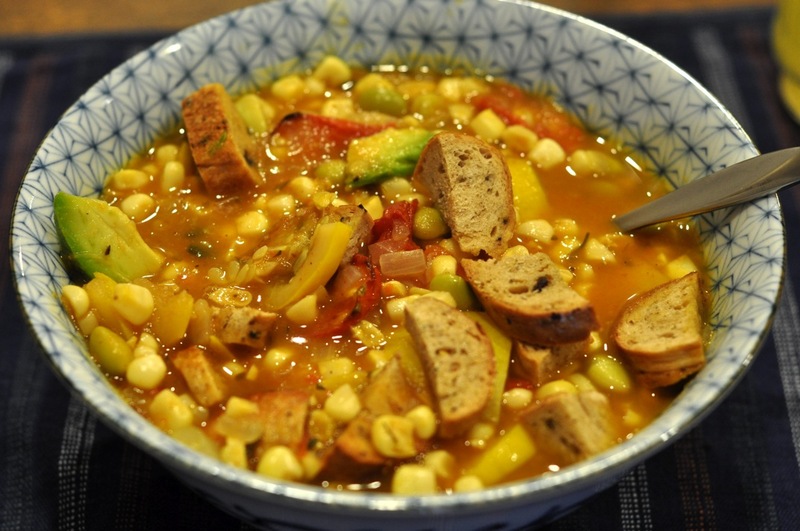 Spoon stew into bowls, top with sliced avocado, and serve with bagel croutons or crusty bread. Your preferred spices, or none at all: garlic powder, black pepper, salt, etc. Place bagel pieces on a lightly oiled baking sheet. Use an oil mister to spray pieces with olive oil. Sprinkle spices, if using over bagel pieces. Place baking sheet in oven and bake for 10-15 minutes, or until bagel pieces are crisp but not burned. They will continue to crisp-up as they cool. Allow them to cool on the baking sheet. Store in a sealed container or use immediately on stew. I need to learn to wear an apron. I have one. It’s colorfully striped and my mom gave it to me several years ago. Do I ever think to put it on when I’m about to make a huge mess in the kitchen? No. It sits in a drawer right in front of me while oil spatters on my shirt an little flecks of tomato sauce make their way onto anything white that I might be wearing. I should really wear the apron while I’m eating, for that matter, since balsamic vinegar and pasta sauce rarely make it to my mouth without leaving a drop here and there. When I started grating the carrots for this recipe I remembered my apron, got it out of the drawer, and put it on. No carrot juice left it’s mark on me! Now for the muffins. It’s been a while since I’ve baked my favorite treat. The time was right for muffins this morning. I was craving chocolate after breakfast (who doesn’t?) so I shuffled through some cookbooks and my recipe box for a chocolate chip vehicle. A recipe for Carrot Cake Bars came up as the winner. I’ve made these bars many times before and they always satisfy my craving for carrot cake without making me feel too guilty if I eat several a day. How did bars become muffins, you ask? I don’t have the right pan to make bars and muffins come pre-portioned. I swapped out raisins with chocolate chips and made the recipe vegan, since Lee ate the last eggs this morning. Necessity is the mother of invention! Hot from the oven with melting chocolate chips in every bite, these satisfied my chocolate craving. 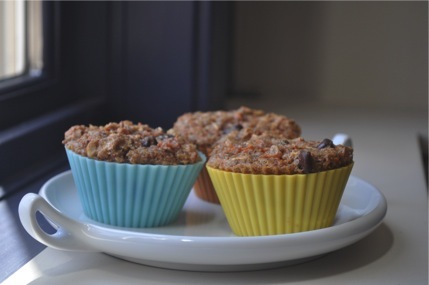 I love how oats give muffins crunchy tops and chewy centers! C is for carrot. C is for chocolate: Muffins on a cute little plate from my grandmother. In a small bowl, combine ground flax seed with water. Set aside. In a medium bowl or in the bowl of a stand mixer, beat together sugar and butter (or oil). Add the milk, flax mixture, and vanilla. In a separate bowl, combine flour, oats, wheat germ, baking powder, salt, and cinnamon. Add dry ingredients to wet ingredients, stirring gently until just combined. 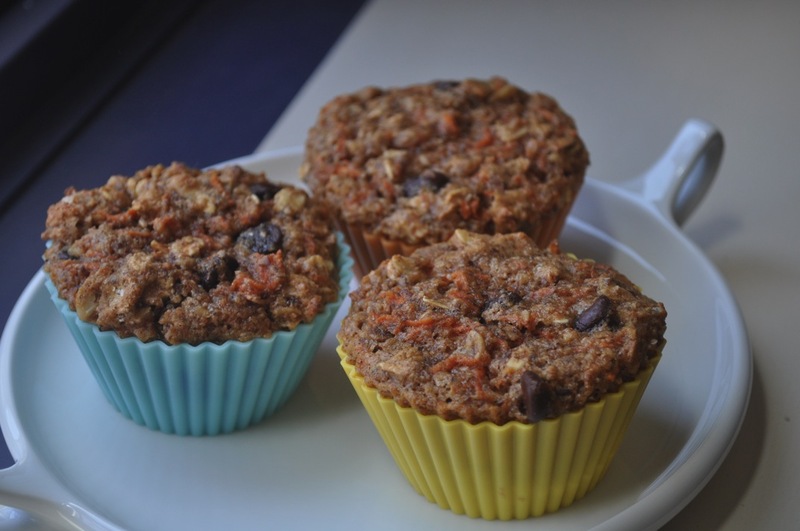 Fold in grated carrot and chocolate chips. Bake at 350 F. for 25-30 minutes or until the tops are crispy and brown. Next up: The sourdough loaf I’ve been baking but still haven’t captured on film? ICE CREAM in my new ice cream maker? I know, maybe some sourdough waffles in my untested waffle iron. I’m sure all these things will make it to the blog eventually!